The Houston Rockets spent almost no time celebrating their first-round playoff series win over the Minnesota Timberwolves on Wednesday night. For the top-seeded Rockets, it simply moved them a little closer toward their goal of bringing the franchise its first title in more than two decades. From the moment Chris Paul joined the Rockets in a blockbuster trade from the Los Angeles Clippers last summer, the Rockets have talked incessantly about their desire and belief that the pairing of the two star point guards could propel this already good team into contender status. A 65-win regular season led by Harden’s MVP-caliber play and Paul’s work in a top supporting role gave the Rockets the NBA’s best record for the first time in franchise history and added to the belief that this could be the year they win it all. Despite not playing their best at times, the Rockets easily handled the eighth-seeded Wolves, turning in three blowout wins in the 4-1 series triumph, capped by Wednesday’s night 122-104 victory. “We’ll continue to get better, work on some things, figure out who we play and take it from there,” Harden said. They move on to the Western Conference semifinals for the second straight season and look to return to the conference finals for the first time since losing to the Golden State Warriors in 2015. But first they’ll get a few days to rest as they await the winner of the series between the Thunder and Jazz. Utah leads 3-2 after Oklahoma City overcame a 25-point second-half deficit to avoid elimination Wednesday night. Coach Mike D’Antoni said it’s difficult to do too much preparation before they know who they’ll face. While the Rockets have their eyes on winning their first title since taking back to back trophies in 1994-95, the next round will be a benchmark of sorts for Paul considering his disappointing playoff history. The nine-time All-Star has faced criticism after making nine previous playoff trips without advancing past the second round. The worst of those flops came in 2015 against Houston, when Paul and the Clippers had a 3-1 lead in the conference semifinals. They got blown out in Game 5 and squandered a 19-point second-half lead in Los Angeles in Game 6 before falling in Game 7 at Houston. 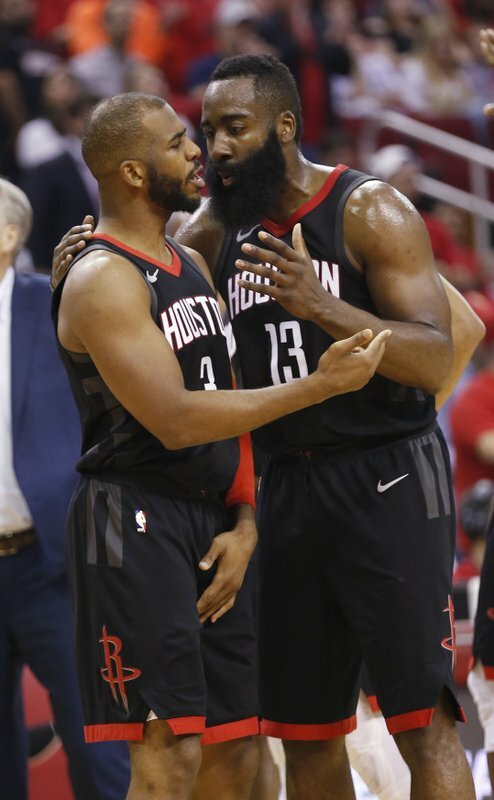 He bristles when the subject is brought up by reporters, but both Harden and Trevor Ariza said Paul discussed that series this week as a cautionary tale when Houston took a 3-1 lead over Minnesota. Paul carried the Rockets with a 27-point performance in a Game 2 win against Minnesota and scored 25 points in Game 4 when he and Harden fueled a 50-point third quarter that allowed the Rockets to come back to Houston a win away from wrapping up the series. While his scoring helped Houston through this series, perhaps more important to Houston’s success was what he did to facilitate scoring by others like Clint Capela, who led Houston with 26 points on Wednesday night. Paul had a tough time in the first game of the series when he tied a season-high with six turnovers. In the next four games he piled up 29 assists with just three turnovers to help Houston advance. Minnesota coach Tom Thibodeau marveled at how difficult it is to deal with both Harden and Paul after the pair combined for 21 assists on Wednesday night. While Houston’s offensive prowess was evident throughout the year, the Rockets hope that their work on defense against Minnesota shows that they’re solid on that side of the ball, too.